"Your project should reuse as many parts of the game as possible. You can remake it into something totally different and unexpected, or perhaps even make it into a new game altogether. 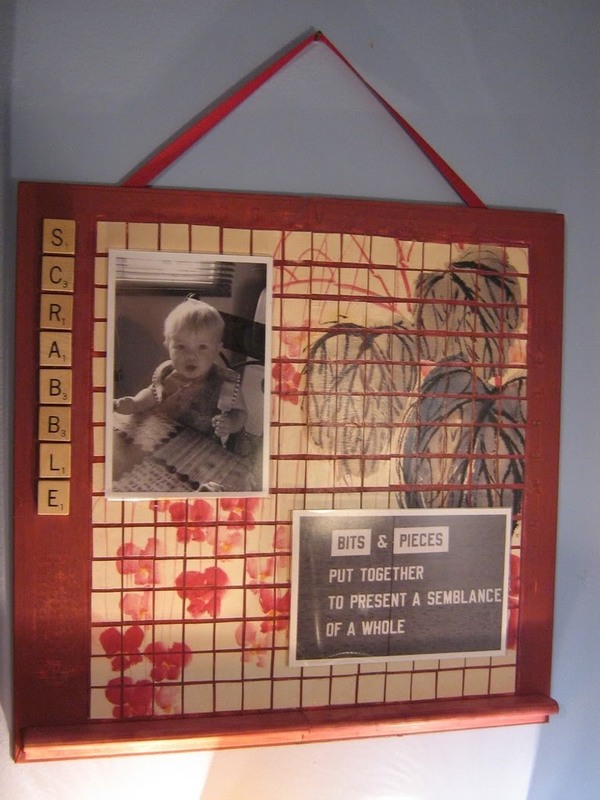 You can use other craft supplies and components in your project, but the results should really focus on the board game elements." 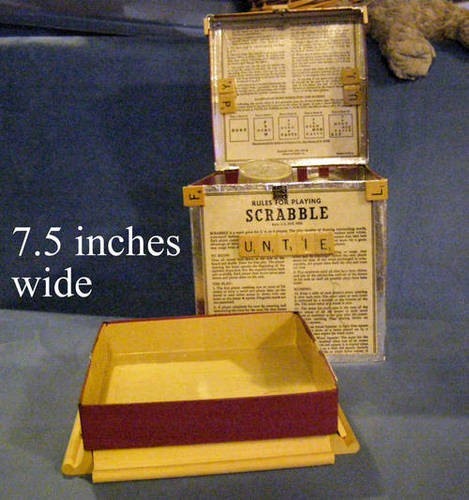 Suereal's design featured her archenemy, SCRABBLE. 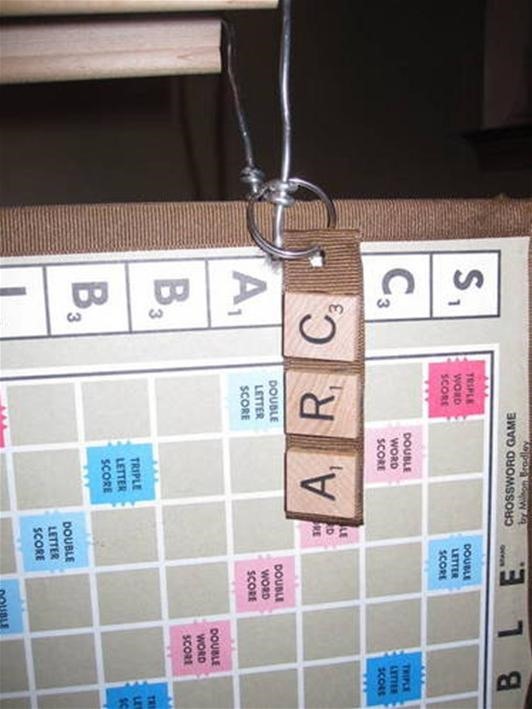 "OK...so Scrabble and I are not friends. I'm just enough dyslexic for it to be..well...Scrabb-Hell. 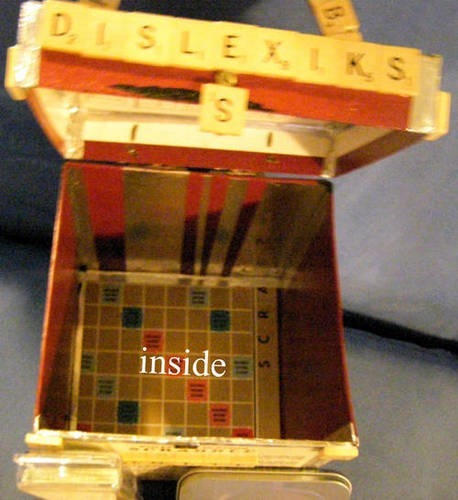 I have all ways been fond of the Dyslexics Untie! Tshirts and wanted to use that some where. The handle is (as far as the internet would tell me) psych speak for fear of spelling." 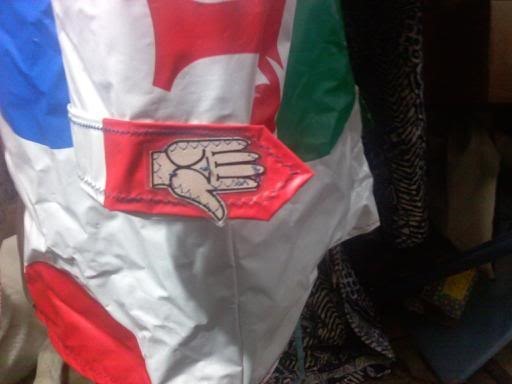 "The back of the handle spells my "handle"....suereal. I used four of the tiles to support the handle on the inside of the lid, 2 for the hinge, 4 as bumpers for the front corners, one for the latch (that has a magnet and a brad to keep the lid closed...you still can't pick the box up by the lid tho...) and the rest as decoration. "I tried to turn the tiles so they looked more like patterns than letters. "The tray/stand pops off the box. It can be used to hold little projects that I might be working on. It's lined with what I thought was paper tape, but it's really slick on the not-sticky side so it should be easy to clean up." 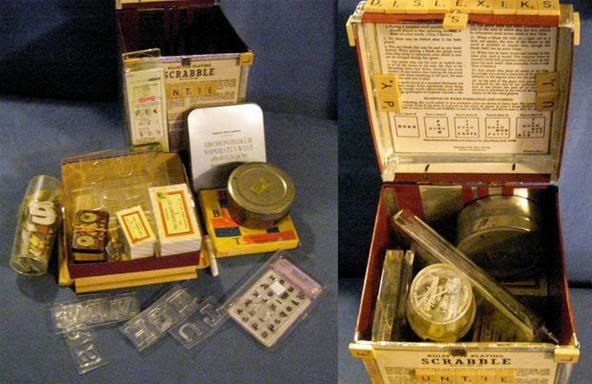 "My Scrabb-Hell box now holds all my alphabet rubber stamps and other alphabet stuff. 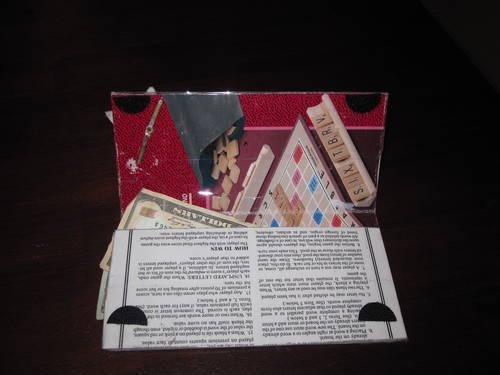 I bought a Clue game and will use that to make boxes to go in the Scrabb-Hell (I finally have a CLUE!!). But I just got it the other day and did not have time to do that before now. I should mention as well...I used aluminum kitchen tape to cover any cut edge. If the edge was good, I tried to not cover them up. 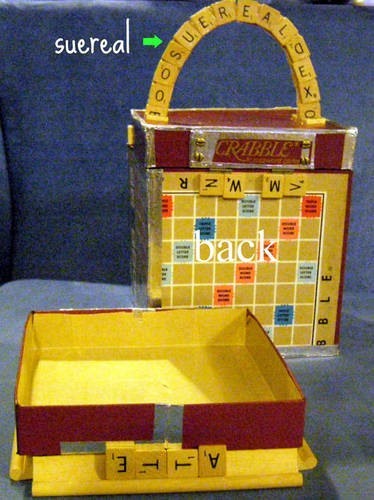 I used Weldbond to glue the tiles to the box. I used lots and lots of Weldbond to make the tile handle. It is just tiles and glue, no other support. All in all I'm happy with it. It's surprisingly sturdy for just being a board and box." 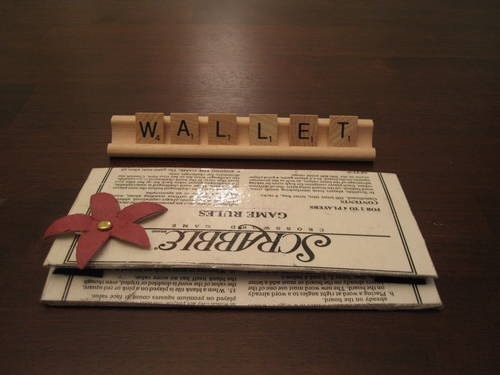 Also in this competition was a SCRABBLE purse and wallet from Alliero. 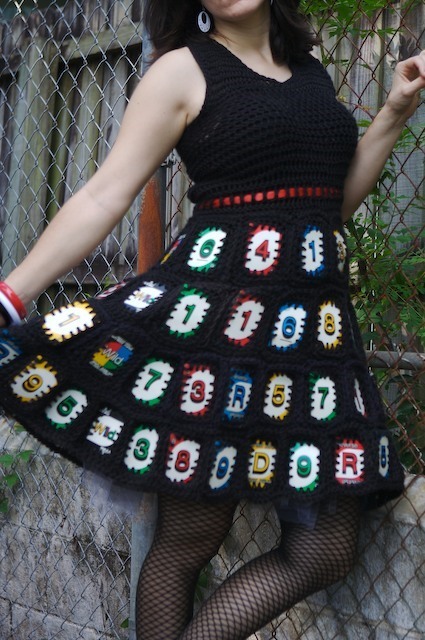 This is actually quite impressive— and fashionable nerd attire. 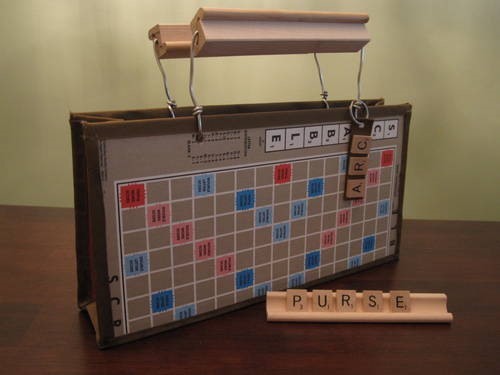 "I decided to take my love for Scrabble as well as my obsession with fun purses and combine them....so here is what I came up with. 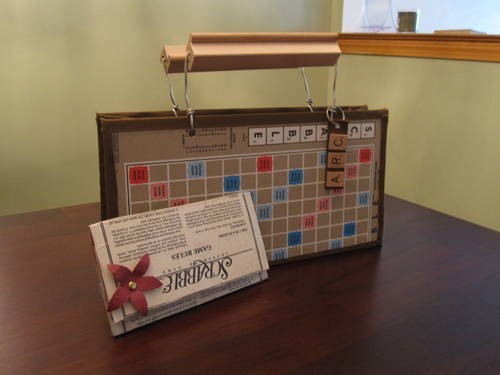 "I decided to create a purse using the Scrabble board. 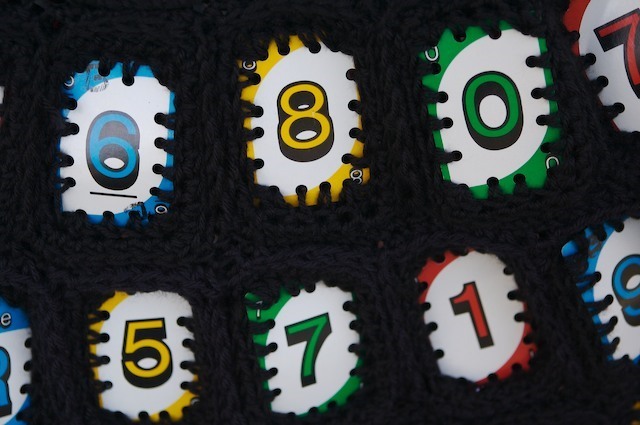 I stuck to a traditional style purse to keep the integrity of the game board. I used pieces of the box to create the sides, and base of the bag. 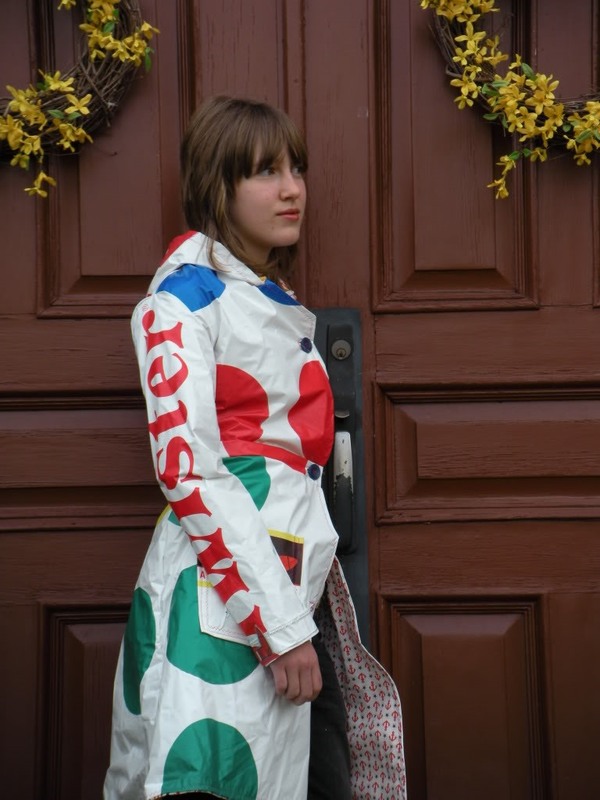 I added a piece of coordinating fabric on the inside as well as ribbon on the edges to make it look more finished. The letter holders were used as the handles of the purse and I just attached them to some wire. One of my favorite details on the bag is the "monogrammed" hang tag with my initials. I simply just glued the tiles to a ribbon and punched a whole in it for the key ring! 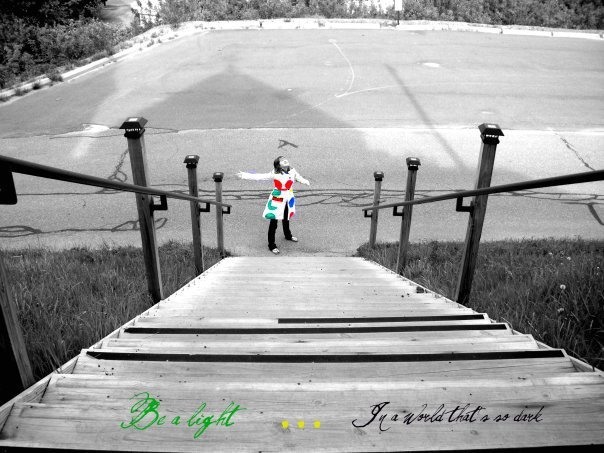 (Definitely something I will be creating more of!!!)" "When I finished making the purse, I really felt that I needed something else to go with it, and, I couldn't just waste the rest of the box. So, I made a wallet from the lid of the box, some packing tape, and two pieces of Velcro. The wallet needed something so I added a flower (great suggestion from one of my students!) 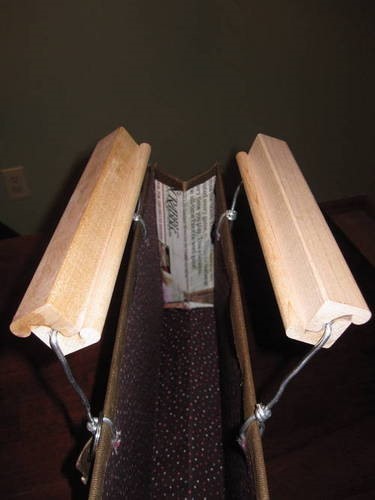 that I made from the leftover base of the box and secured with a brad." "Your challenge is to remake a board game into something new using as many of the parts of the game as you possibly can -- every part of the game if possible! Your resulting project should have an overall theme that you work all the components of the game into. 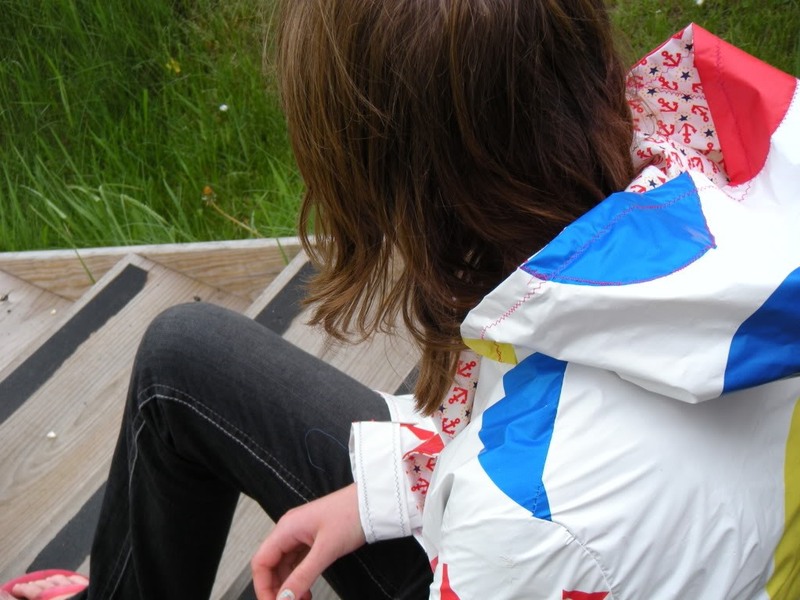 "You can remake it into something totally different and unexpected or perhaps even make it into a new game altogether. 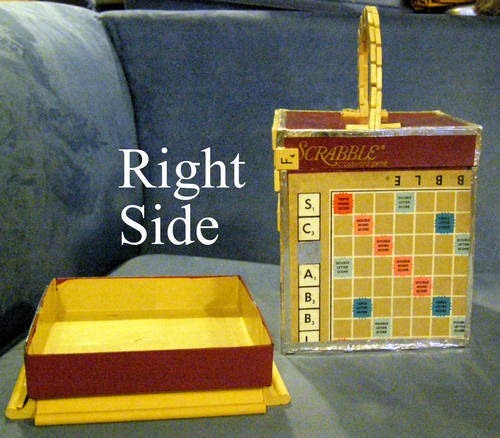 Whatever you're inspired to do with the board game you choose! 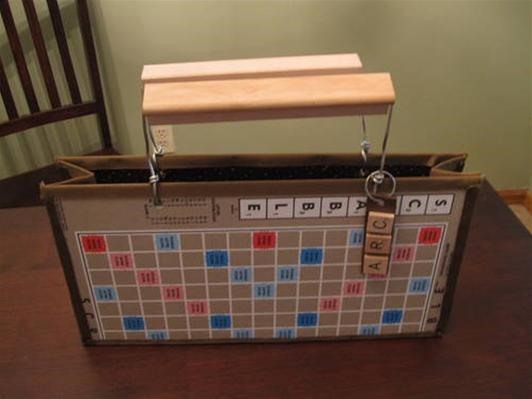 (You can use other craft supplies and components in your project but the results should really focus on the board game elements.)" 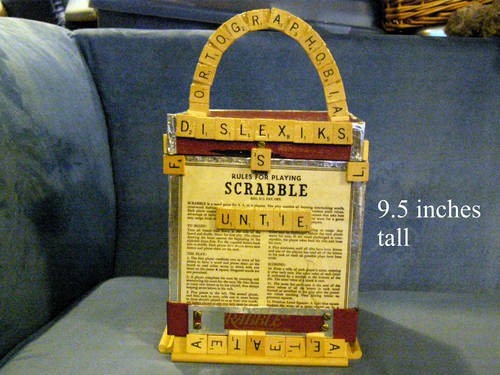 Two of the entries featured interesting SCRABBLE concepts. 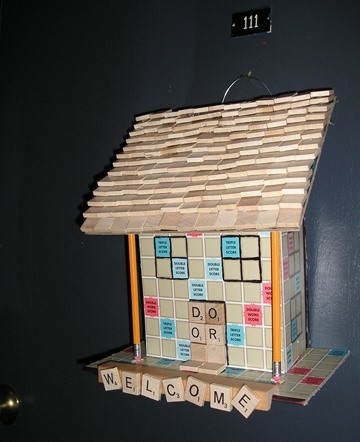 One is a birdhouse welcome decoration for a front door (by MrsSmores), and the other an "interchangeable Scrabble Board Art" piece (by saltandpepper). 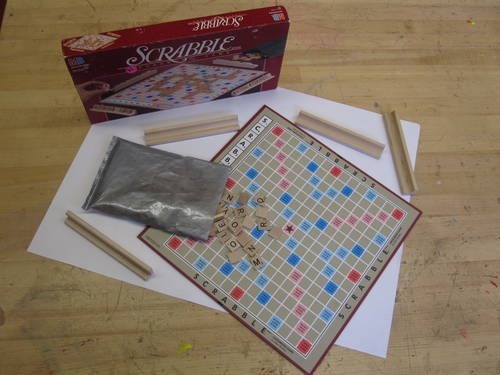 Sadly, none of these SCRABBLE ideas won the challenges. 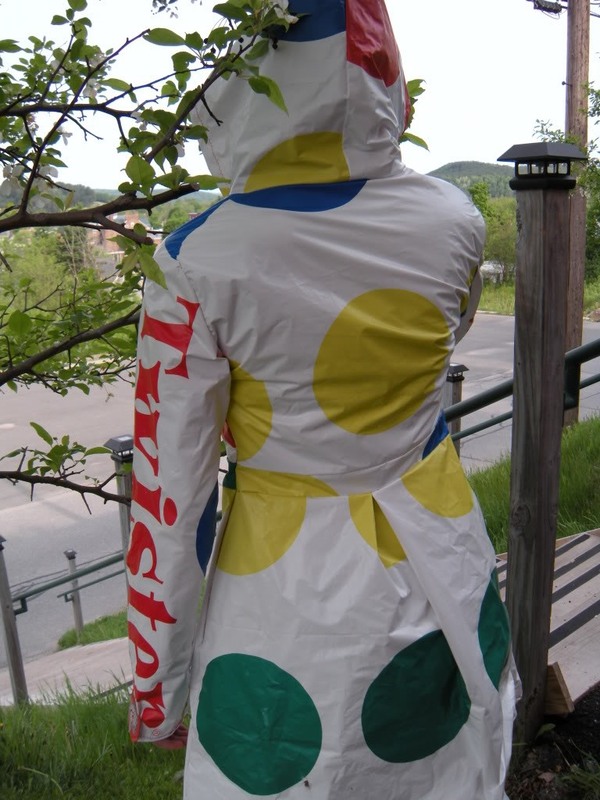 The winner for Craft Challenge #51 was Nicoleeoliee_4_Life with her ridiculously awesome Twister Raincoat. 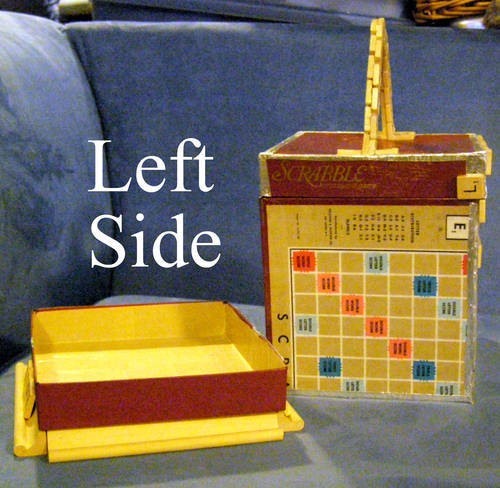 Other game reinventions included Candy Land, Chess, Chutes & Ladders, Trivial Pursuit, Monopoly, Bingo and a Ouija board. 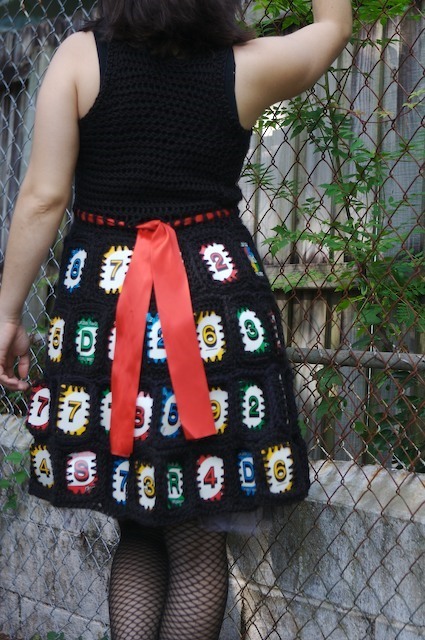 The Craft Challenge #21 winner was KittyCreates' Crochet Uno Dress. Other contestants revitalized Monopoly, Clue, Connect Four, Operation, Settlers of Catan and more. 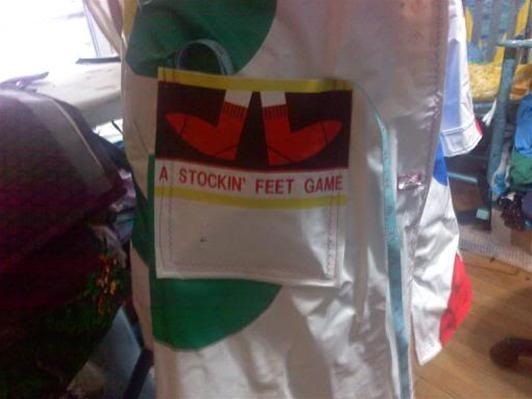 This all makes me want to create my own board game anomaly. I already have a few ideas churning in my head... how about you?